This bouquet is created with three/2.5" succulents accented with kalonchoe blooms swathed in babies breath. You may choose from the following colors: pink, purple, orange, red or yellow. Shipping is set up for express delivery service to preserve the babies breath, certain zip codes only have 2 day service, this bouquet must travel overnight. Mixed Succulent Bouquet.Created with two dozen succulents in all different sizes and blue tones accentuated with blue or purple statice and white kalonchoe. The stems are wrapped in jute ribbon, twine or white satin ribbon. This bouquet is created with three/3" succulents accented with kalonchoe blooms swathed in babies breath, and ti purple or green leaves for collar. Wedding bouquet crafted with 15 succulent rosettes and fuchsia accents. This bouquets measures about 8 inches in diameter. Succulent wedding bouquet created with echeveria hen and chicks. This bouquet is created with 7 2-inch succulents and a few splashes of color from statice flowers or kalonchoe blooms. Three (2.3-3 inch) Echeveria succulents with filler flowers and foliage. Bouquet measures approximately 7 inches across. Pick your accent color and write it in the note section at checkout. Flowers accent colors are: white, yellow, orange, red, pink, fuchsia, purple. Ribbon options are: natural jute, ivory, sage green, blue and white. Pick Your Arrival Date At Checkout. All wedding bouquets must be placed a minimum of two weeks in advance of your delivery date. If needed in less than two weeks please email us to confirm. We will ship so your order arrives 2-3 days prior to your wedding date. Succulent plants offer a large array of shapes and colors that are delightful and stunning. 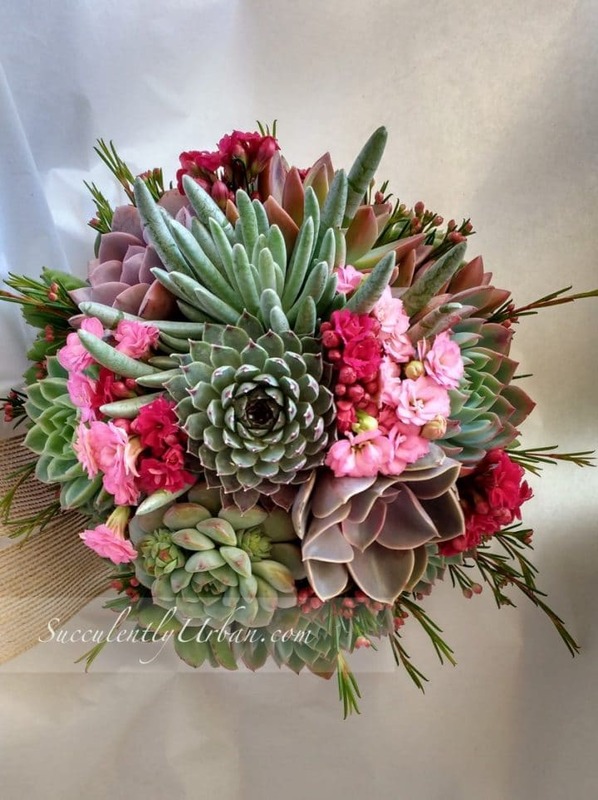 This succulent bouquet is created with an ample assortment of echeveria succulents, crassulas and sedums in various shapes, color and sizes. The carefully selection of succulents and their arrangement results in a stunning succulent bridal bouquet that features a cascade of senecio rowleyanus (or string of pearls).